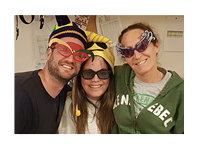 Welcome to Camp Kennebec, a wonderful summer camp for kids and teens with special needs, learning disabilities, and developmental delays including autism, Asperger’s, ADHD, ADD, Down Syndrome, OCD, brain injury, anxiety, social skill and other challenges. Each summer, Kennebecers have a great time and accomplish more than they expect. At Camp Kennebec, we help our campers create the fabulous summer camp memories they deserve. We’re looking forward to welcoming your son or daughter to camp this summer. Everything you want in a summer camp & more! Create a Kennebec Indie Team (K.I.T.) program for young adults 18+ that combines life and job skills training, with the best of Camp Kennebec activities and events.